Home / Who We Are / Team MiraVia / Lisa Danielson, M.Ed. Lisa Danielson is Director of Training for MiraVia, LLC. She is an experienced educator and consultant, who presents workshops and seminars on learning-focused conversations for mentoring and supervision, facilitating collaborative groups, and professional learning designs. Lisa has collaborated with the CA Department of Education, the Commission on Teacher Credentialing and the University of CA, Davis. Her expertise on varied statewide development projects includes beginning teacher support, Common Core implementation, and teacher evaluation systems development. In her 34-year educational journey Lisa taught at all levels of K-12 and developed and lead professional development seminars in cooperative learning, mathematics, and language arts. 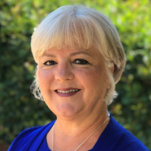 For 12 years she provided leadership and professional development to the California Beginning Teacher Support and Assessment (BTSA) induction community. Serving as a regional director and state leader, Lisa served on the team that developed and field tested Learning-Focused Mentoring: A Professional Development Resource Kit. She helped develop a formative assessment model for beginning teachers that integrated learning-focused conversations based on the Mentoring Matters model. Lisa earned her B.S. and M.Ed. in Educational Leadership and Educational Administration from California State University, Sacramento.